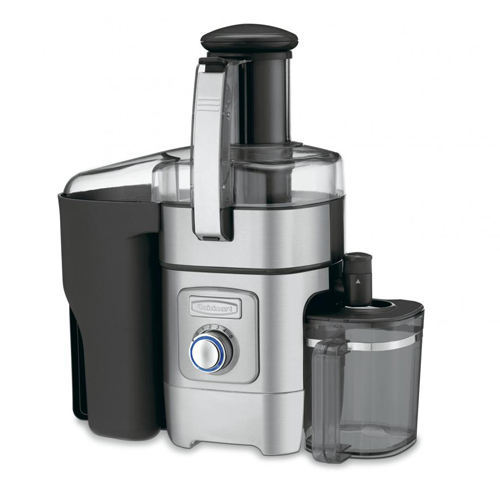 The Cuisinart Juice Extractor has 3 inches feed tube that easily handles the whole fruits & vegetables and the adjustable flow spout eliminates spills & drips for clean countertops. The 5-speed control dial is easy to operateand lets the juice the leafiest kale, softest berries or crunchiest apple into the 1-liter pitcher. It features unique filter basket that reduces foam, anti-drip adjustable flow spout and all removable parts that are dishwasher safe. The Die-Cast Juice Extractor has many exciting features for users of all types. You can extend the lifetime of your Die-Cast Juice Extractor with the purchase of a FactoryOutletStore Factory Protection Plan. See the Die-Cast Juice Extractor gallery images above for more product views. The Die-Cast Juice Extractor is sold as a Brand New Unopened Item.